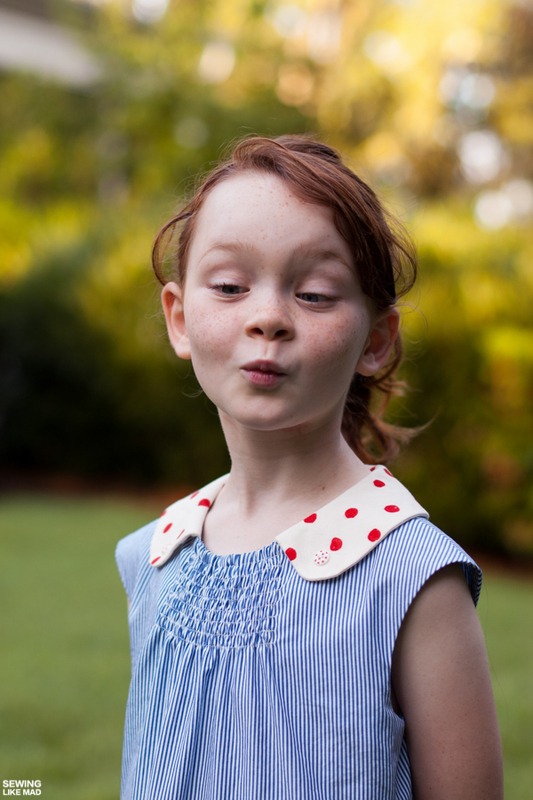 I love clothes with fun details and the Dear Prudence Dress from Sew Pony is exactly one of those. 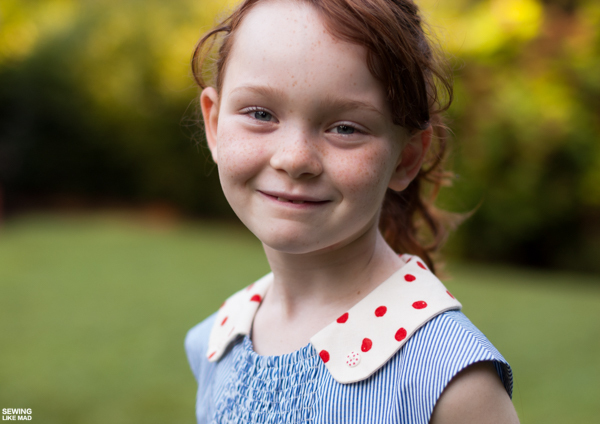 The shirring in the center front neckline is such a beautiful detail and a fun one to sew. It was one of those details where I had to consult the pattern's tutorial to see how she did it and when I realized she put elastic in the very top row I sent Suz a virtual high five. Genius! If you follow my Instagram you already know that this was W's Fourth of July dress this year. 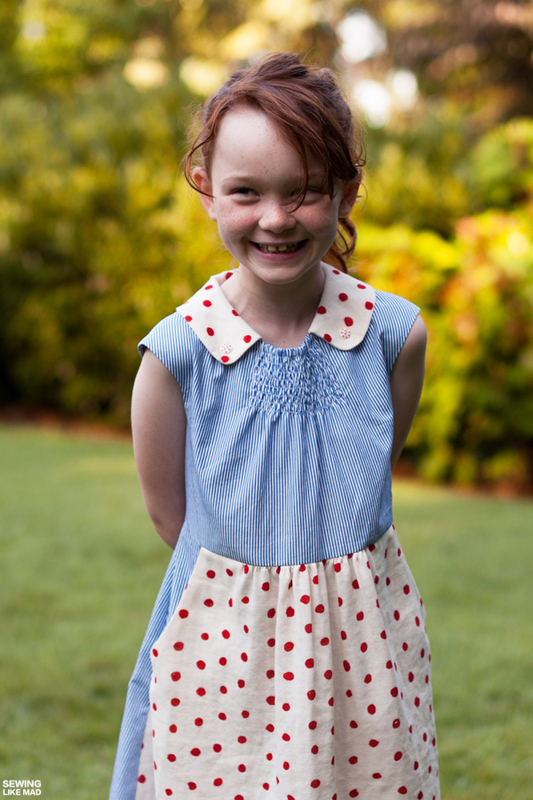 I do not normally sew patriotic dresses for them but little sister E had one that I made for her preschool graduation in May and so of course big sister felt entitled to get one too. And since I really want them to feel that it is an advantage for them that Mommy sews, I felt this was a request I wanted to fulfill. Of course with the small payment of blog photos, ahem. The two fabrics are a stripy cotton shirt poplin. And a cream double gauze with red dots from Nani Iro Kokka Pocho. To my delight (and my credit card's horror) did I realize while writing this post that Miss Matatabi still carries it in her Easy shop HERE. I changed a few things on the pattern. I changed the shape of the pockets from square to curved. I felt that went better with the rounded collar (and yes, I'm probably way overthinking it, haha). And then I changed the lining a bit. I basically changed it into a facing instead by shorten it. The whole upper bodice is lined and that is overall a great idea. Except if you live a place where July is burning hot like we do. Suz very cleverly uses the bottom of the back lining to create a casing for the elastic, so I had to find another solution for that feature. Since the dress already had shirring elsewhere is was an obvious choice to add a couple of rows of shirring instead. When using shirring instead of a measured piece of elastic you loose a bit of the control regarding the width of the back. It all depends on fabric, numbers of rows of shirring, the machine's tension and techniques used. My shirring might be the reason for the front skirt to pull towards the back side like you can see on the photo above but it's not a big deal to me. And sometimes I really wish I followed my own advice! If someone asked me if it is clever to sew rows of shirring on a back waistline in a straight line, I would have said nope. Since the waist is shaped somewhat as a cylinder you really need a curved line for it to appear horizontal/straight. What happens if you do a straight line, you may ask? Well, look at the photo above, ha. 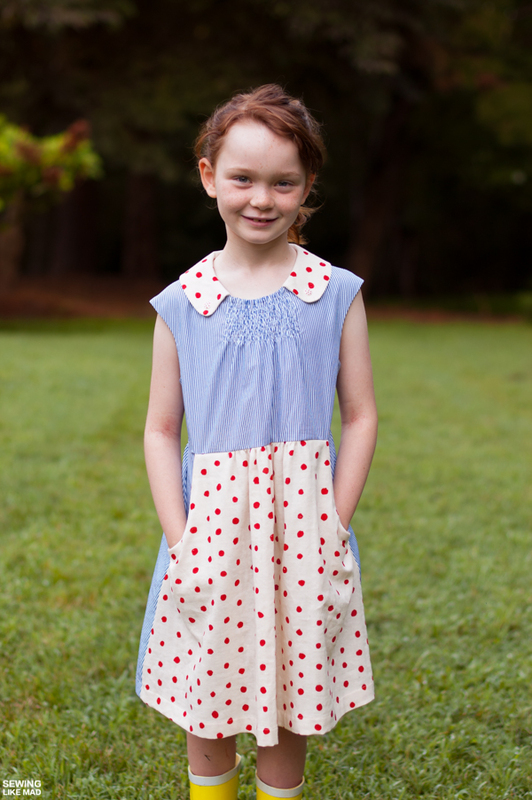 What I should have done was to put the dress on the child and then put a few guiding pins in what appears to be a straight/horizontal line and then sewed my shirring after those pins. OH WELL...there is always next time! The collar is perfectly drafted and drapes SO well! I will always recommend to make your inner collar a tiny bit smaller than the outer layer. I have a trick somewhere in THIS post that makes it all super easy. I wish the collar had notches though to help placing it on the neckline where it meet the shoulder seams and where it stops (and the shirring starts) at the front. It just makes the sewing process more smooth and it helps eliminate mistakes. Oh boy, this dress is just so freaking cute! There is one thing I think I will change with the next one I make and that is the width of the front bodice's waist - although I first have to look into if the problem is my back waist shirring being too gathered. But on W there was just a bit too much fabric when the dress hung freely on her. It could be easily fixed by gather the bottom of the front bodice a bit and then gather the front skirt a bit more than it already is. I'll have to experiment, ha. I also want to add that I have a habit of checking the paper pattern before I even touch my fabric and I cannot recommend this enough for several reasons. One reason is the obvious which is to check if the seams matches up. You can never trust seams when they are cut in fabric because they can stretch or the fabric has shifted a bit while cutting. But the paper never lies (if it is printed and taped together correctly of course, ha). And yes, on my list of posts-I-will-probably-never-get-done is certainly How to Check a Paper Pattern. Gah! Another reason is that it helps you understand what you are about to sew. You can't check a paper pattern if you do not know which parts go together. So you might spend 5-10 minutes checking paper pattern pieces but you will gain that time or maybe more in sewing time because you know what goes together now. 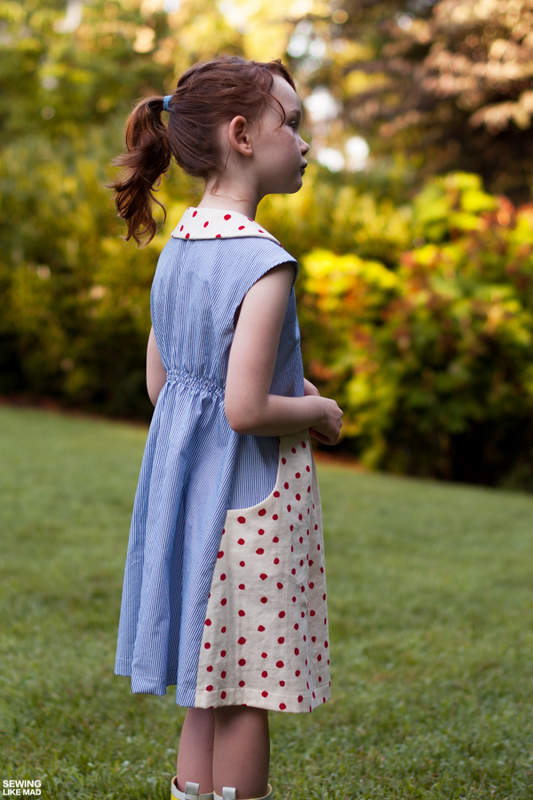 And when you get more experienced it will also help you with the order of the sewing process. I know you have the tutorial from the pattern but again, the less you have to consult that, the more time for sewing.....and maybe you will start feeling more courageous about finishes etc. Who knows where it can leads when you start checking paper patterns haha. Lastly it will help you with your general understanding of patterns and how they go together. I originally wrote the above because I found a small mistake in the length of the front and back side seams but it is all fixed now! Phew, for pdf patterns that you can fix, update and send out a new version. Going cross-eyed is a new feature in this 7 year old's facial expression vocabulary so naturally we needed that in the post too. So the conclusion is a GREAT dress which will work all year round since it comes with 3/4 length set-in sleeves too. I could totally imagine this dress in a thin lovely wool and fully lined of course. Oh my head is already spinning. I love the cap sleeves for warmer weather. Suz has her Dear Prudence tour going on at the moment and soooo many amazing dresses are popping up over there. Check it out yourself HERE. 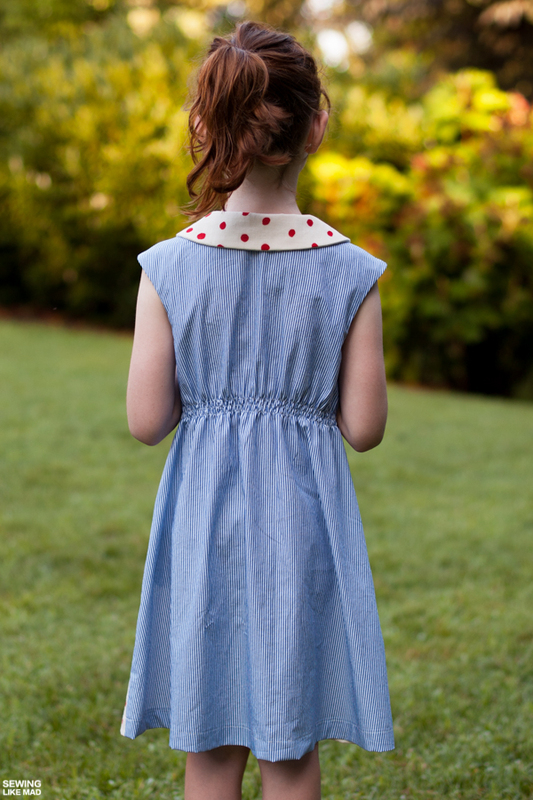 Get your own Dear Prudence Dress HERE. Thank you! And ehhh happy belated Fourth of July to my American readers! This is so cute! I love this dress! Great post, I sort of check paper patterns, just to see how it goes together, but I never measure anything. Great tip! I loved this when it popped up on instagram, and I think it's sweet how the front skirt almost looks a but like an apron. Very 4th appropriate for sure! The dress is just lovely! And that's a great observation about pinning to the waistline curve instead of making a straight line. One reason I prefer paper patterns to PDf and I am willing to pay more is that I feel a lot of mistakes can be made, because I've made them, when cutting and taping together. 1/8 inch off on a few seams adds up, especially for a fitted ladies style. Such a beautiful dress - I love how you combine fabrics! Thank you for the tips - I learn so much from you!! Like Ines, I hardly ever bother to check the paper pattern as well unless it's during testing, so this is good to know. I would love to see a post on How to Check a Paper Pattern (hint hint!) ;) You are the best! I love your version of the Dear Prudence so much, Mie! As I was reading your post I was thinking: "I thought about rounding the pockets to match the collar too!" and "My front skirt was also a bit longer them my back skirt!) and "I also always check the pattern pieces before I start to sew!"... Funny, isn't it? This is an amazing pattern review! Thanks so much!